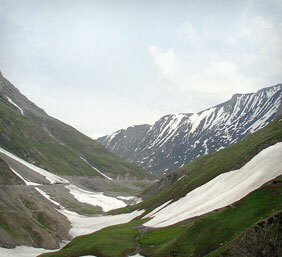 Kargil is a part of Suru Valley and this valley forms the mainstay of Kargil district. Situated on the north-eastern foothills of the great Himalayan Wall, the valley extends 140 km beyond the town of Kargil to the Penzi la pass which is the entrance of the Zanskar Valley. The valley is picturesque especially in spring when the apple, apricot and mulberry tree are all in bloom and in autumn when they are laden with fruits. It is worth visiting place to experience the serene beauty of nature. Situated at an altitude of about 2,704 m, and close proximity to the Line of control, Kargil has Kashmir Valley to its south while in the west is the Pakistan administered Kashmir’s Baltistan. The place served as a battlefield during the India-Pakistan war in 1999. The destination is famous for its valleys, small towns, monasteries, rural villages and shrines. Kargil occupies a significant place in India's martial history drawing hordes of tourists. The place is indeed a heaven for adventure seekers as they can enjoy adventurous activities such as trekking and mountaineering. Kargil also host archery contest during the month of May. Some of the major attractions include Sani Monastery. Built by the King Kanishka of the Kushan Dynasty during the 1st century, the monastery is regarded as one of the oldest religious sites in Ladakh and Zanskar. Mulbekh Monastery is another prime attraction in Kargil region. The Zanskar region is also frequently visited by tourists. Some of the other popular attractions in Kargil are the monastery of Rangdum, Zongkhul Monastery and Stonday Monastery. Other attractions such as the Phugthal Monastery, Karsha Monastery and Shargole Monastery at Padum in the vicinity of the destination can also be visited. Best time to visit Kargil is during May and June.